Career: "Haven of Rest" by Douglas Gurton says "Within a matter of weeks [of 31 May 1922] the liner "Llanstephan Castle", 11,293 gross tonnage, anchored off the Pier. "The master of the LLANSTEPHAN CASTLE Capt. Bowden-Smith was in charge of the Union Castle ships in the River. "Capt. Bowden-Smith, a most genial gentleman, endeared himself to the children by buying sweets at the nearby shops and distributing them. "Waterside Memories" (of Tollesbury) by Frank Drake, Page 66 refers to the LLANSTEPHAN CASTLE being laid up off Tollesbury "in the 1920s". Broken up 1952. 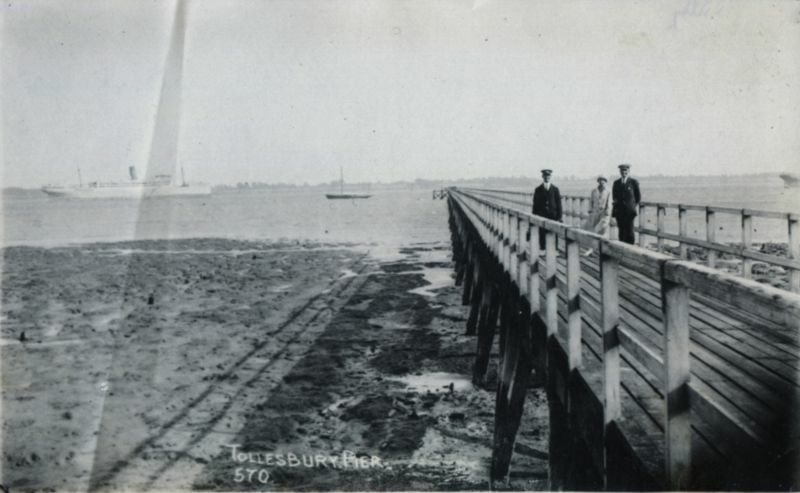 Above: Tollesbury Pier Postcard 570. The large ship laid up to east of pier is thought to be the Union Castle liner LLANSTEPHAN CASTLE. She was 11,348 tons gross, built 1914 and eventually scrapped in 1952. Date: 1920s.